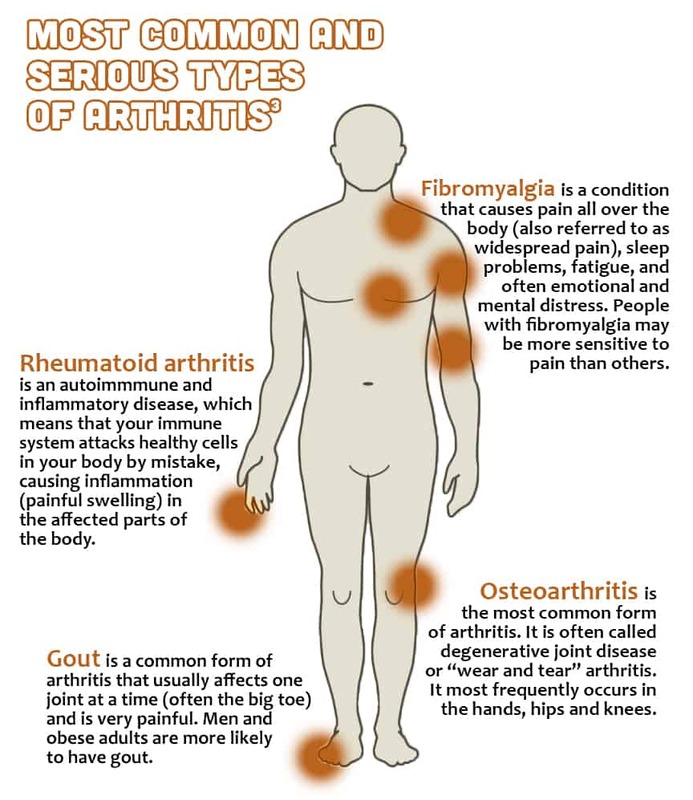 Arthritis includes more than 100 diseases (including osteoarthritis, rheumatoid arthritis, and fibromyalgia) and conditions that affect joints, the tissues that surround the joint, and other connective tissue. Symptoms vary depending on the specific form of the disease, but they typically include pain and stiffness in or around one or more joints. 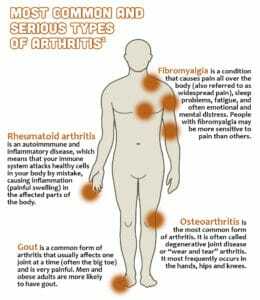 Some rheumatic conditions can also involve the immune system and various internal organs of the body. An estimated 54.4 million adults in the United States have arthritis. This rate is higher than the prevalence of other chronic diseases, such as diabetes — which affects roughly 30 million adults in the U.S.
Across Jefferson, Lewis and St. Lawrence counties, nearly one-third (29.4%) of the Medicare population had rheumatoid arthritis or osteoarthritis as of 2015. Yes, children can get arthritis. The most common form in children is juvenile idiopathic arthritis (JIA), which can cause pain, swelling and stiffness of one or more joints. Other symptoms may include fever, fatigue, rash or loss of appetite. Since JIA can cause permanent damage to joints, early diagnosis and proper treatment are important. Some children with JIA can achieve permanent remission, which means the disease is no longer active. Are people with arthritis more likely to develop complications from the flu? Sometimes, people with forms of inflammatory arthritis, like rheumatoid arthritis and lupus, have weakened immune systems, which can make them more likely to develop complications from the flu. Some medications used to treat inflammatory arthritis can also weaken the immune system. Just like there are many different types of arthritis, there are also a number of different causes and risk factors for the disease. Some of these risk factors cannot be helped. For instance, the risk for most types of arthritis increases as you get older. Women are at higher risk for certain forms — like osteoarthritis, rheumatoid arthritis and fibromyalgia — while men are more likely to have gout. Genetics or a family history of arthritis may also increase one’s risk for developing the disease. Start low, go slow — if you are not yet active, start with a small amount of physical activity (3-5 minutes, twice a day) and add activity a little at a time, allowing your body to adjust to the new level of activity. Modify activity when arthritis symptoms increase, and try to stay active. Activities should be “joint friendly,” such as walking, dancing or water aerobics. Recognize safe places and ways to be active — walk in areas where sidewalks and pathways are level, free of obstructions, well-lighted, away from heavy traffic. Talk to a health professional or certified exercise specialist about your abilities and health goals. Healthcare professionals and communities also have a role to play in the prevention and management of arthritis. Local clinics, aging services, adult education programs, employers and other stakeholders can encourage participation in chronic disease self-management programs and arthritis self-management programs.